You are emailed a document and you have to sign it and send it back. You could print out the document, sign it, and then scan it back in and email it. But there’s a better, faster way. We’ll show you how to quickly add your signature to any PDF document, saving it as a standard PDF file that can be read anywhere. We won’t be covering digital signatures that few people know how to read. Digital signatures are something else entirely. A digital signature is cryptographically secure and verifies that someone with your private signing key (in other words, you) has seen the document and authorized it. A digital signature is way more secure than a traditional ink signature or a signature image overlaid on top of a PDF document. But we won’t be using those here. Why? The answer is simple — most people are expecting a document with a little scribble of ink on it. Send them a PDF file with a digital signature and they won’t know what to make of it. For many businesses, simply accepting signed documents by email rather than forcing you to fax them is a huge technological leap. So sure, the below methods aren’t perfectly secure — but neither is printing something, scribbling over it with a pen, and then scanning it again. At least this is faster! Instead of digital signatures, we’ll be using electronic signatures. They are just like traditional ink signatures, but applied electronically to documents without any printing or scanning required. 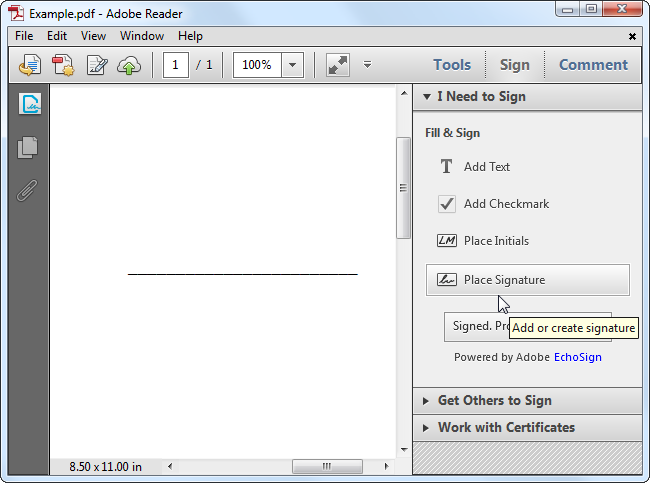 We haven’t been big fans of Adobe Reader in the past — the program has been notoriously slow, bloated, and vulnerable, although that has all improved somewhat — but Adobe Reader has good, integrated digital signature support. Most people would be better off with a more minimal PDF reader that isn’t packed with so many features, but every now and then all those features can come in handy. Other third-party PDF readers may offer this feature, but they generally require you purchase a paid version before using their signature features. If you’re worried about security, you may want to leave a third-party PDF reader as your main PDF reader and disable Adobe Reader’s browser integration, just firing it up when you need to sign a document. Adobe Reader’s own settings menu no longer has any option for disabling its browser integration, so you’ll need to disable the Adobe Reader plugin in the browsers you use. 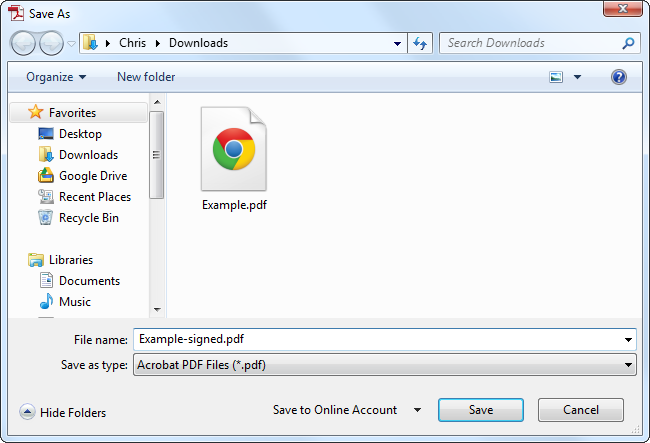 First, open the PDF document in Adobe Reader. 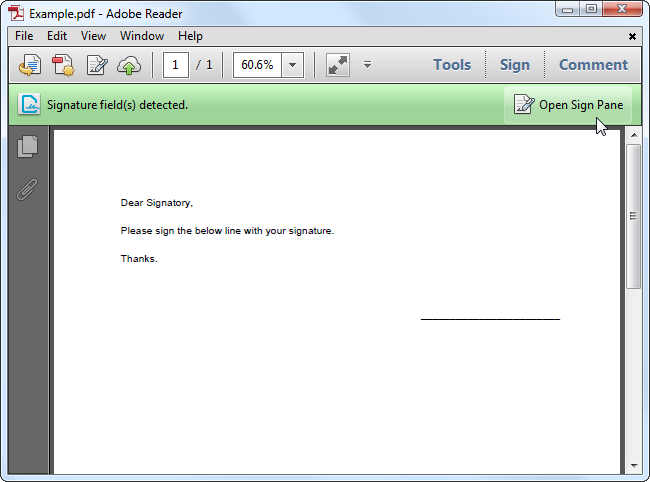 If Adobe Reader detects a signature field, it’ll prompt you to open the Sign pane. If not, just click the Sign button at the top-right corner. Use the Place Signature option to use a real signature. The other options here just add text, checkmarks, or initials — not good enough. Type my signature: Type your name and Adobe Reader will automatically generate something that looks like a signature from it. You’ll probably want to avoid this one, as you’ll want something that looks more like your real signature. Use a webcam: Sign your name in black ink on white paper and Adobe Reader can use your webcam to capture its shape. Draw my signature: Draw your signature with a mouse. If you have a stylus or amazing hand-eye coordination, you may be able to draw something that looks like your real signature, but this probably won’t be good enough. Use an image: You can sign your signature to a piece of paper and use a scanner to scan it to your computer, then crop it and create an image file from it. If you do this, you can use the Use an image option to insert your signature from an image file. Using a webcam will be the ideal option for most people. 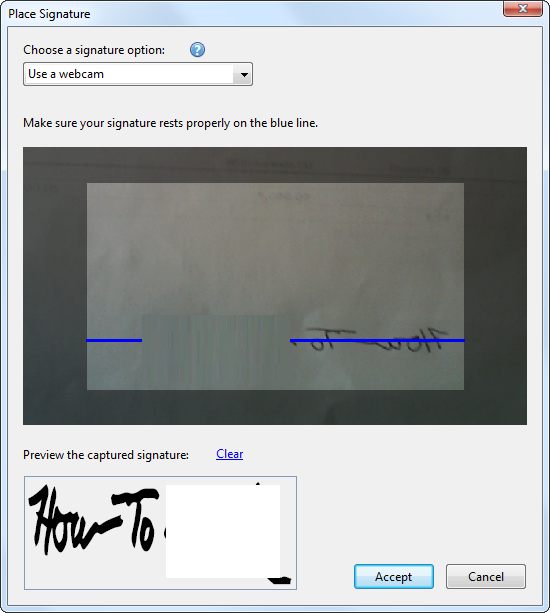 Sign a piece of white paper in black ink, hold it up to your webcam, and scan it in. 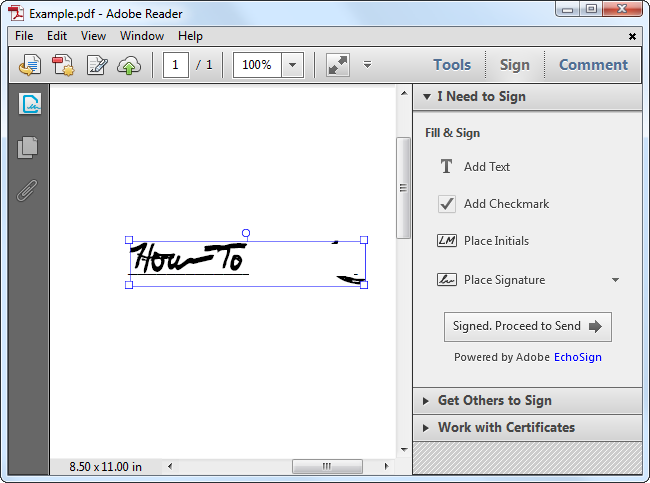 Adobe Reader doesn’t just take a photo of your signature — it generates a new signature that matches the shape of your signature, so it can be inserted cleanly into other documents. Once you have scanned your signature, use the Place signature button to insert and position it anywhere in a PDF document. You only have to scan in your signature once — you can quickly insert your signature in other documents in the future. You can now save your PDF file using the standard Save option under the File menu. 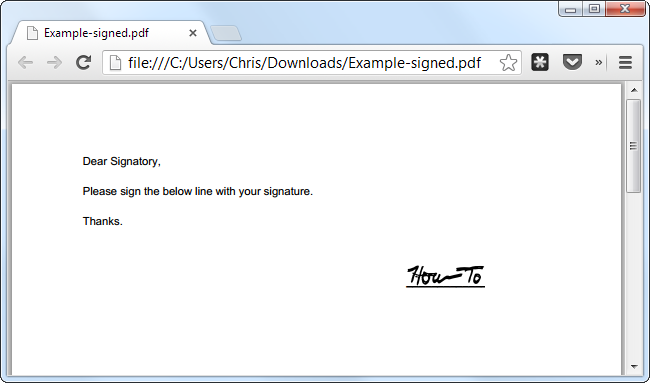 This will create a new PDF file with the same name as the original PDF, but with -signed at the end. Of course, you can name the new PDF anything you like. Adobe will prompt you to use Adobe EchoSign to send your signed document, but you can just decline this offer to continue. All we have done is inserted a new image into the PDF file — no fancy digital signature nonsense — so the signed document should be readable in all PDF readers. If the signature doesn’t look realistic enough and you would prefer that standard ink-on-paper look, feel free to scan it in with a scanner and insert it as an image instead. Okay, maybe you don’t want to use Adobe Reader for this — we get it. 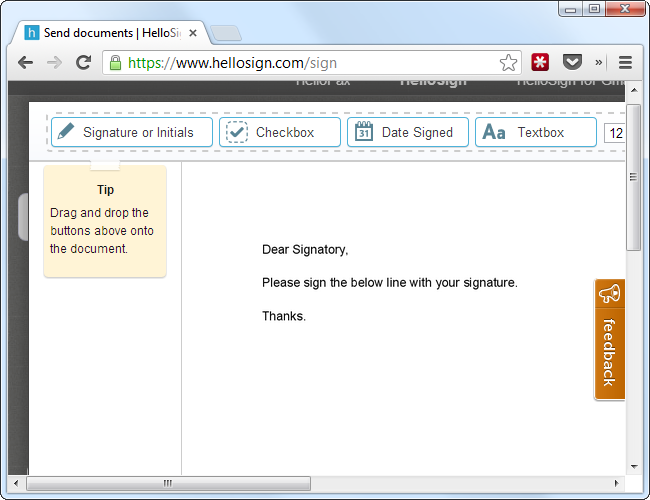 If you’re looking for a web app, try HelloSign. It integrates directly with Gmail so you can sign documents right from your email. it also synchronizes with Google Drove, Dropbox, Box, SkyDrive, and Evernote. HelloSign allows you to upload a signature file, draw it in with your mouse, or take a photo of your signature with a smartphone. Once it has your signature, it can sign and email documents quickly. Its integration with Gmail and ability to quickly sign and send documents may make it the ideal solution if you frequently need to sign and email documents without downloading them and using a desktop application. HelloSign is free if you just need a single-user account, so you won’t have to shell out any money for the privilege of electronically signing documents. These aren’t the only options, of course. Mac OS X users can use the signing feature built into Apple’s Preview PDF reader. Third-party PDF readers like PDF-Xchange PRO also offer this feature, but you will need to pay for it. If you are looking for a mobile app, you may want to look at something like SignNow.